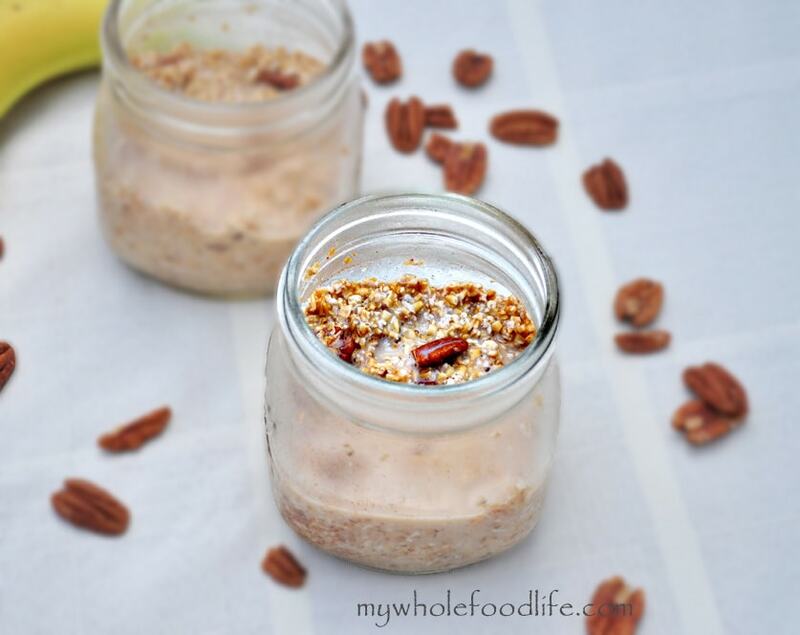 Banana Nut Overnight Oats. Overnight oats are very popular these days. I have been having overnight oats for breakfast every morning lately. They are so easy and travel well too. My husband takes them to work with him. Readers keep asking me to create new flavors, so here are some healthy and vegan banana overnight oats to try. I’ve been making my overnight oats with stevia lately. I don’t notice the after taste in this recipe at all. I love the fact that there is no sugar added. If you do not want to used stevia, I will put other options in this recipe as well. Throw all the ingredients except for the banana in a jar and mix well. When you are ready to eat, slice the banana and mix it in. I thought putting the banana in the night before would make it too mushy. I make 5 of these at a time and store them in the fridge for easy breakfasts all week. Enjoy! I loved this recipe, I made it last night! My husband and daughter gobbled it up, too. I used chopped dates as a sweetener and it turned out delicious. These are the easiest, most delicious breakfasts ever!